By 2018, 28 percent of public sector workers will have reached age 61. What is your community doing to start recruiting the next generation of local government employees? 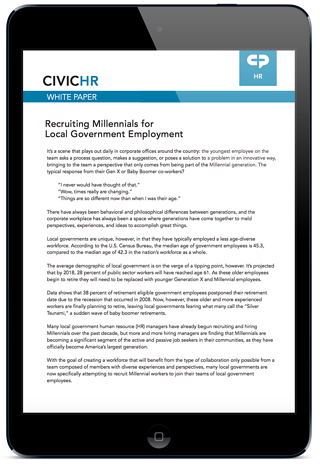 Our white paper will help you better understand the need to recruit millennials into your municipality and how to best attract them in the digital age. To help you diversify and strengthen your local government administration we’ve developed this whitepaper to help you better recruit, hire and retain these valuable civic employees.